American designer and artist Dan Corson created the Empyrean Passage installation to mark the boundary between West Hollywood and Beverly Hills, California. 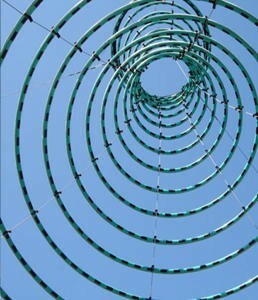 The temporary architecture consists of a spiral of vinyl and electroluminescent lighting suspended over the pavement. Black dashes on the interior create an optical illusion, altering the viewer’s perception of the colour of the sky at certain times of the day.Empyrean Passage is reminiscent of both a theoretical black hole and portal into celestial worlds. Empyrean is the final and fiery level of heaven as depicted by Dante.The form is constructed like a giant hoop skirt and gracefully moves in the wind, creating a gossamer lighting effect overhead. While this project is an oculus to the heavens, more focus is usually made to more terrestrial stars in this neighbourhood. This project utilises extremely “green” electroluminescent lighting. The entire structure consumes less electricity than a household nightlight and operates on a photo cell.